In affluent America, the heartland of disposable income and the home of the term "Mad Money," every motorcyclist should have a Honda XL200R nestled in his garage. Maybe every rider doesn't really need an XL, but everybody can have fun on one. For roughly $1400, you can buy yourself this sleek personal all-terrain cycle; it's a machine that can take you anywhere the better street and dirt bikes can, but at a fraction of the cost. The XL makes an ideal second or third motorcycle for those with a little extra cash to burn. Or if funds are tight, the XL is a practical, one-and-only bike. Over the years, dual-purpose bikes have developed a reputation for mediocrity; indeed, early dual-purpose machines tended to emphasize economy over performance. However, that has changed in recent years as both Yamaha and Honda have put more front-line technology in their dual-purpose bikes. With its Pro-Link rear suspension and long-travel front fork, the XL200R has benefited from this trend. Since dirt riding is the more demanding of its two roles, the XL200R has its roots in Honda's dirt-bike technology* and is based on its dirt-only relative, the 1983 XR200R. 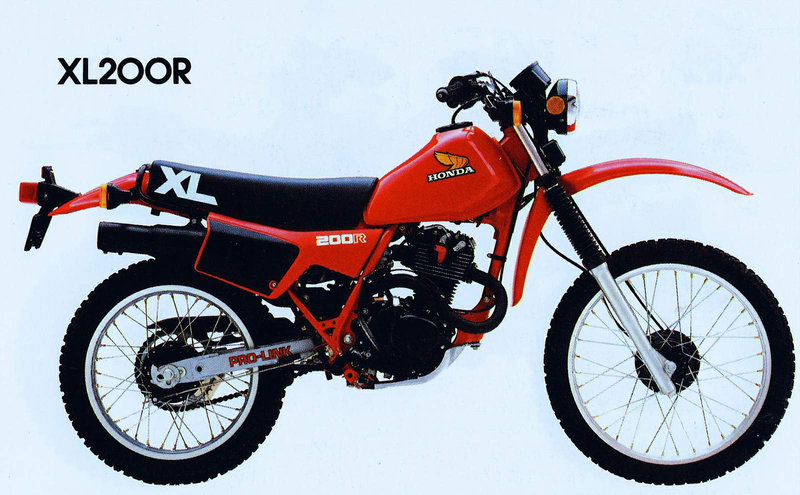 We tested the 1983 XL200R, and the '84 model is virtually unchanged. All of the dirt-riding amenities are included in the 200, such as long-travel suspension and a narrow four-stroke single-cylinder engine. This basic powerplant has been available in varying displacements for years, and although its simplicity and durability are nearly without equal, it's never been well known for pumping out lots of power. However, the XL does have enough steam to be freeway legal; given a half-minute run, it will just touch 80. That's fast enough to collect plenty of speeding tickets, without being fast enough to get you thrown in the slammer. Predictably, the XL200R is no dragstrip scorcher. The Honda takes 17.24 seconds to cover the quarter mile, loafing along at 71.1 mph at the finish. Of course, nobody expects a lot of power out of a tiny two-valve four-stroke. But they do expect good manners and predictability, and on those counts the Honda delivers. The XL rarely requires much choke when cold; generally, you pull the instrument-mounted choke knob and give the bike a kick. If it doesn't start, you open the choke back up, and the 200 fires with the next swipe of the kickstart-er. Then it's ready to ride immediately. The Honda idles with metronome-like consistency regardless of engine temperature. The carburetion is smooth and hiccup-free even when you tug the throttle wide open at low revs. The bike doesn't really have a power curve; it's more of a plateau. With a modest amount of urge right from idle, the 200 displays a remarkable resistance to stalling even when plonking along in the dirt at low rpm. Honda has given the little single plenty of flywheel inertia, so nothing happens suddenly. This is a blessing for beginning riders, and is also useful in the light-duty dirt riding the bike is designed for. Even experienced dirt riders can have a lot of fun on the XL off-road, since there's enough power to let you exceed the limits of the trials tires if you push the issue, or get you over some rugged terrain. As a city bike, the XL200R is a good choice. It can get the holeshot across an intersection (as long as the car pilots aren't in a big hurry) and can maintain highway speed indefinitely. Rider comfort (or lack thereof) is the limiting factor in touring use. As on a Jeep, the ride is choppy on the road. Engine vibration is acceptably subdued until about 55 mph in fifth gear. If you throttle up to 60 mph, though, the buzzing is intense enough to make 15 minutes the bearable maximum for most riders. The narrow seat necessary for dirt riding is very uncomfortable for the rider who is traveling any distance. Those accustomed to full-size street bikes will find the Honda's handling alarmingly quick at high speed. Don't worry, though, it never gets out of hand. Twisting, bumpy roads are where the XL is really at home. The light, quick steering lets you flick the bike in and out of corners with alacrity. Bumps that would bounce an lntercep|or into the bushes are great fun on the XL. On some back roads the XL200R would be unbeatable-at least until an XL600 came along. The 200R works as a nicely unified package in the dirt as well. In natural terrain, the XL lets you get away with things you really shouldn't. Honda didn't cut many corners on the XL200R's suspension components. Fast dirt riders would want a more rigid front fork and. adjustable rebound damping in the Pro-Link shock, but the fast, dirt riders aren't the ones buying XL200s. The chassis works great in the dirt at trail-riding speeds, and enough air pressure and spring pre-load adjustment is provided to make it suitable for spirited play too. The brakes are powerful enough to lock either wheel on pavement, yet have sufficient control to inspire confidence in beginners while riding in the dirt. Tire are the major shortcoming in the dirt. Even though they are pretty good as dual-purpose tires go, riders reared on knobbies will be sliding all over on the Bridgestone.trials tires. However, they are reasonably predictable in the dirt and stick well on the street. Given the role the XL is supposed to play, and its reasonable $1398 asking price, the XL200R can't be faulted. It's versatile, easy to ride, and will take you almost anywhere wheels can go. The XL200's major competition comes from Yamaha in the form of the XT200. Both bikes are quite competent both on-and off-road, but in 1983 Yamaha undercut the list price of the Honda by $49. 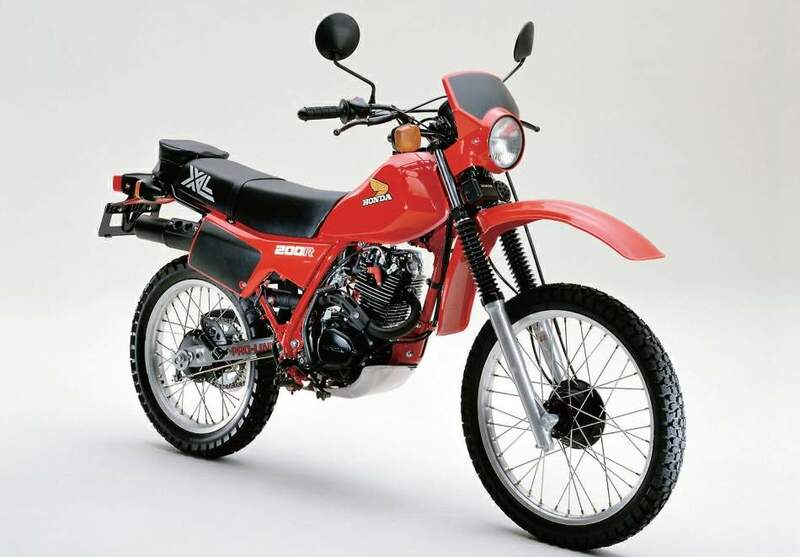 It is still not known whether Yamaha will change the XT200 either mechanically or in price for 1984. Both of these machines are the most economical, freeway-legal, all-terrain fun available.